Home / Embracing our connection / Bobby Kennedy was assassinated 50 years ago today. 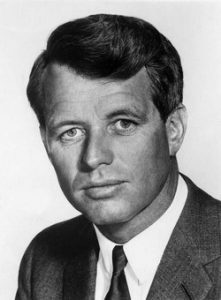 On March 16, 1968, Senator Robert “Bobby” Kennedy announced that he was joining the race for the Democratic presidential nomination after Senator McCarthy’s strong showing in the New Hampshire primary against President Johnson. I, along with many other McCarthy supporters, was infuriated by Kennedy’s opportunistic move. The power of the antiwar left had been split. But the Kennedy mystique gradually won me over, and I enthusiastically shook Bobby’s hand at a political rally on March 21, 1968, in Nashville. After winning the crucial California primary as well as the South Dakota primary on June 5, for a few moments, it appeared Bobby might raise up the Kennedy mantle and revive those glorious moments in American history we called Camelot. I excitedly watched his televised victory speech from the Ambassador Hotel’s Embassy Room ballroom in Los Angeles. As the TV cameras followed, Kennedy proceeded to a press conference through the hotel kitchen. Suddenly gunshots rang out and confusion ensued. I was shaken. “Another leader can’t be gunned down like this,” I thought. But in fact, Bobby was fatally wounded that night, and he died twenty-six hours later. In today’s age of never-ending war on terrorism in which savage violence against individuals and nations has become a daily occurrence, it’s challenging to convey the effect of the assassinations of three of our nation’s most significant leaders within a five-year period. President John F. Kennedy, assassinated in 1963, Martin Luther King, Jr. and Senator Bobby Kennedy, both assassinated in 1968, were men who inspired us, who gave a sense of hope and optimism. And now they were dead. What’s more, there is the impact of the assassinations of Malcolm X in 1965 and Black Panther leader Fred Hampton in 1968. It seemed that anyone who had the spirit and moral authority to move us from the herd mentality and mindless acceptance of the status quo toward a more inclusive, compassionate and just future, would be taken down by an assassin’s bullet.